Ever since we went from having a few tomato plants in pots to a full-scale garden, I’ve had some tomato cages laying around the yard – for years – doing nothing but letting the grass and weeds grow around them. I’ve been seeing Deco Mesh taking over all of the craft stores – everywhere you look there is SOMETHING made out of them – wreaths, flowers, snow men, ginormous bows, trees. 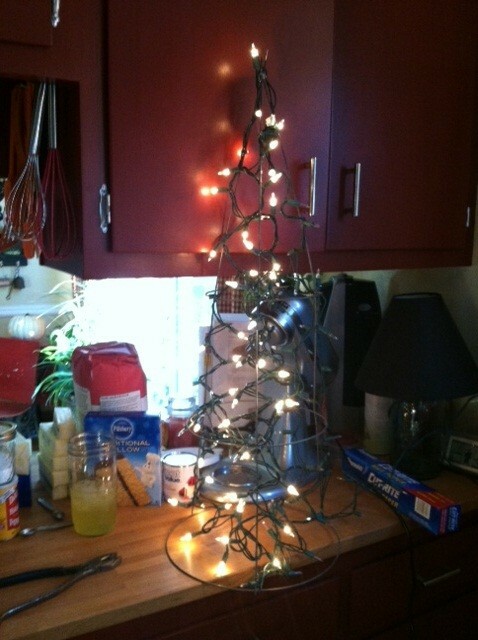 I saw some Christmas Tree versions floating around both Pinterest and the craft stores, so I decided I’d re-purpose one tomato cage into a Christmas tree as a sort of test run. Since I am cheap and generally lazy when it comes to craft projects ( I tend to lose interest pretty fast, so it needs to be a completed project pretty quick), I wasn’t interested in doing any of the versions where you used multiple rolls of deco mesh ($7 for 1 was about all I was willing to spend!) and were twisting and tying for HOURS. 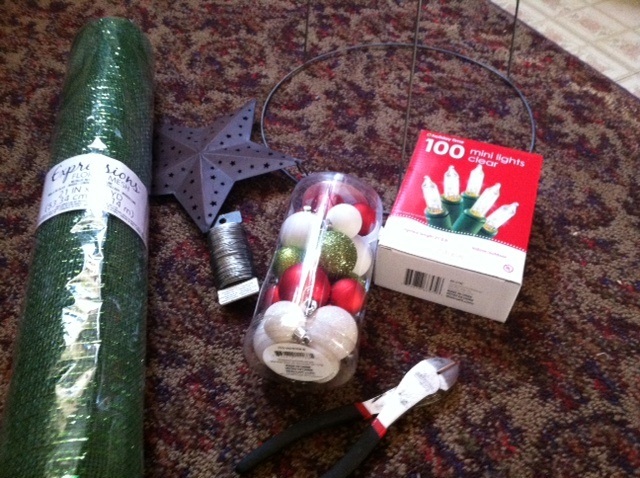 So I purchased some floral wire, 1 roll of sparkly green deco mesh, a tin star and a small container of ornaments. Surprisingly, it’s a pretty simple project and doesn’t really require any particular set of skills – unless you consider using wire cutters a skill – and some time. I’d recommend wearing gloves because I tore the hell outta my hands from the floral wire ends. I used green stranded white lights for mine because I wanted the sparkle of the lights to shine through without the wires really showing. 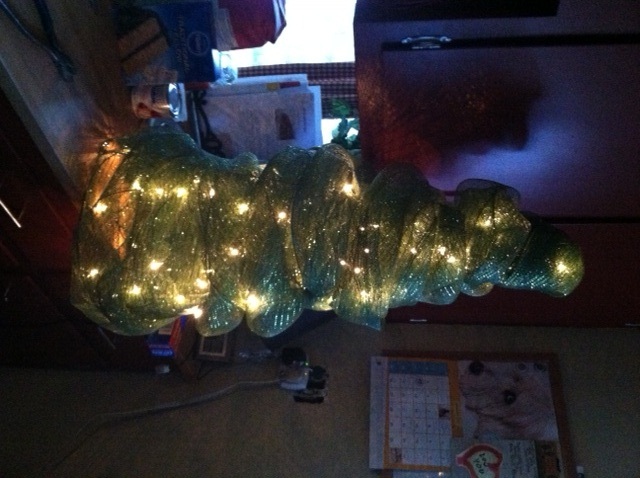 I like the end result of it so much I’ll make another one with the remaining tomato cage! Who knows where I’m going to put it, but at least it’ll be made and can be gift ready should I need it to be! Now it’s time to secure the deco mesh. I started by making a little puff of it that I draped over the tepee top of the tree cage and then wrapped the floral wire AROUND the mesh, securing it to the cage in two places. Since the wire is visible with this method, you’ll want to be sure to drape the mesh in such a way that it covers the exposed wire. 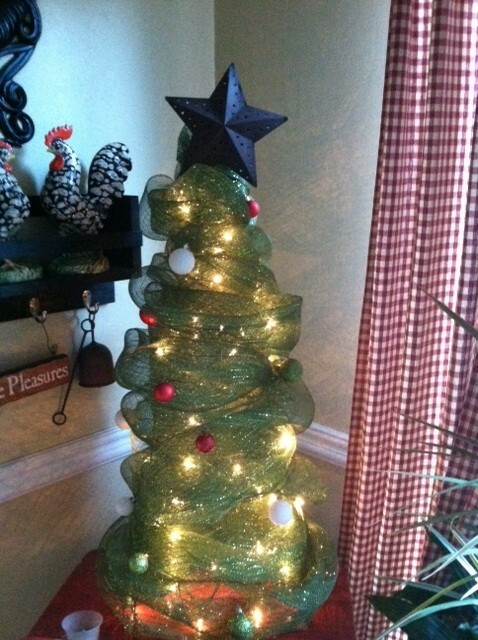 For me it was easiest to get the mesh wrapped around the tree to the base and then go back in and secure it with wire once I had the look I was going for. While I was wrapping the mesh, I did little twists to give it some texture and depth. I had a little bit of extra mesh so I took and looped it around the base and made a sort of knot with it, stuffing any extra fabric up into the tree. 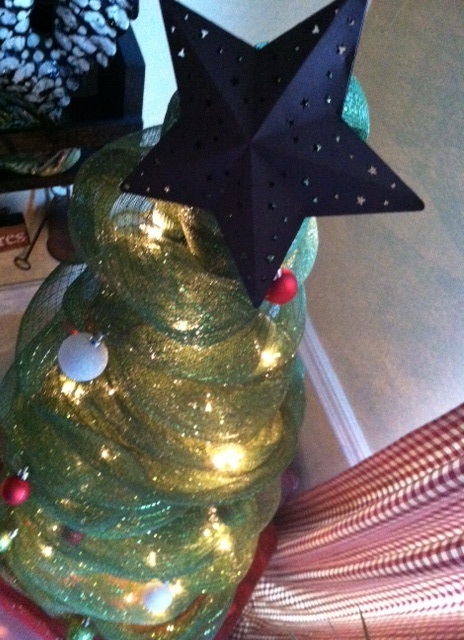 If you don’t want to add ornaments or a topper, stop here. You are done! If you do want to, secure them THROUGH the mesh to the cage to hide the wire. I basically threaded the wire through the holes in the mesh pattern and it kept all the wire hidden. These look great inside, but are also safe to use outdoors. Since they are so light, you’ll want to anchor them so they don’t blow away.